Austria isn't the typical place for dark rock, it seems. 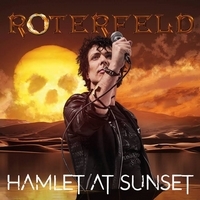 Now the trio Roterfeld is presenting Hamlet At Sunset which isn't Aaron Roterfeld debut. Roterfeld's debut was called Blood Diamond Romance, released in 2011. The opener No Friend Of Mine is a powerful rocker with electronic elements, a dark vibe and is dominated by Roterfeld's vocals. Aaron Roterfeld shows his ability to switch style and pitch. A strong opener! Even darker is Bring Your Own Star To Life which offers metal elements and gothic pieces. It has a pop edge, too. A dash of HIM... Perhaps that's Hiili Hiilesmaa's work... The Finnish producer wasn't the only one involved, Frank Bornemann (e.g. Eloy, Helloween, Guano Apes) and the Berman Brothers (e.g. Cher, Coldplay) were turning the knobs, too. Heavy riffs and melodic keyboard lead you into Flieg, the only track with German lyrics. The vocals are quite intense while the synths give it an old-fashioned sound. With Black Blood they present a heavy, danceable tune in the tradition of Sisters Of Mercy. Spoken words and keys lead you into Sea Of Stones, a slow melodic track. Next in line it Father And Son a 10-minute long opus. The opening passage is just vocals and piano, very intense. Orchestral passages give it a certain dose of drama, fitting perfectly to the lyrics, the story they tell. With Great New Life (Reborn) and You Are The One I'd Spend All My Money On they close this chapter. Roterfeld present a variety of songs which touch different genres... A collection of dark rock tunes.